Bonjour! Herm's now has language support for Français (French), English, and Pirate. Set your language preferences in config.hs! Herm's now conforms to the XDG Base Directory Specification. In short, config.hs and recipes.herms are now stored in ~/.config/herms and ~/.local/share/herms respectively on most Linux systems. At the moment, Herm's can only be installed via stack or cabal, but standalone binaries are in the works! If you're interested developing/hacking Herm's instead of just using it, see Contributing.md instead. Herm's has a pretty intuitive interface for users familiar with other command-line programs! Below is the exhaustive list of all commands and their functionalities. Take a gander! To see where these are stored on your system, run herms datadir. 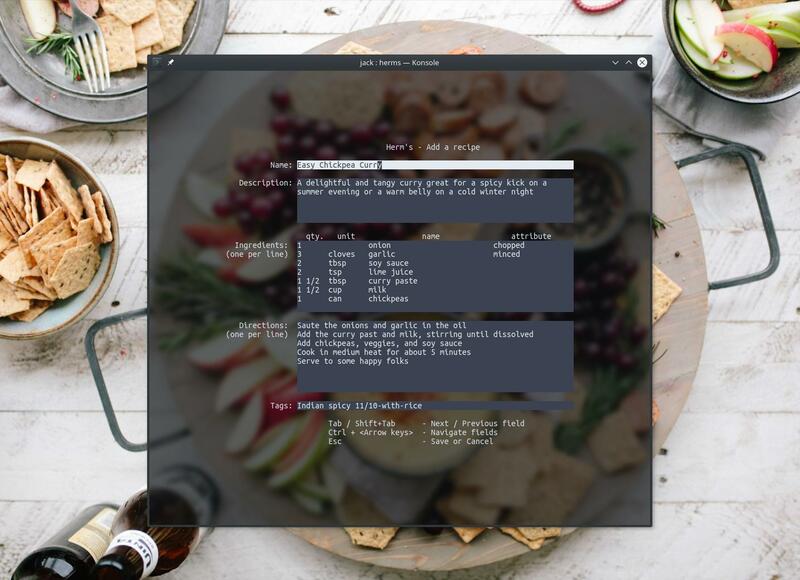 defaultUnit : The default unit system to show recipes in. Options: Imperial, Metric, None. Setting to None will simply show recipes in whatever unit system they're stored in. defaultServingSize : Default serving size to calculate when showing recipes. Can be any non-negative integer; set to 0 for no default. This can be useful when you're always cooking for the same number of people! recipesFile : The recipes file to use. This option currently supports relative (but not absolute) location, as well; if your data directory is ~/herms/data, for example, and you want a recipe file in your home directory called ~/GrandmasHugeCookbook.herms, set this option to "../../GrandmasHugeCookbook.herms". language : Human language to use. Currently supported: "Français", "English", "Pirate"